Historically, the amount of communication required between the production and post production teams has been very limited. In this era of file-based acquisition and delivery, an extensive pre-production dialog is necessary between the two departments. They must work as a team. Many decisions need to be addressed by both teams before production begins. Some of the items that should be discussed include the edit system platform and operating system, shared or standalone storage, the need for either offline or direct to online edit, codec type, bitrate, frame rate, file wrapper, audio configuration, file naming, metadata requirements, among others. All of these factors are important and what may seem like a minor discrepancy to one team may be near catastrophic for the other. Just one small detail that is overlooked may lead to missing an important delivery deadline or lead to excessive unexpected budget overages. There are several key steps that can be put in place in order to eliminate many of the potential issues that could arise through miscommunication and lack of understanding between the show producers, post producers, production media managers, editors, assistant editors and system engineers. Communication between these individuals and departments is critical to a successful file-based production. On the production side, the role of the conventional videotape operator is now that of a media manager. This position requires new and different skill sets. There is a need for retraining conventional videotape operators in order to make them proficient in file-based acquisition, media management, basic IT troubleshooting, network configuration and media file validation. The modern media manager needs to become proficient with tools including Avid® Media Composer®, Adobe® Premiere® Pro CC and Apple® Final Cut Pro®. The production side media manager should be aware of the post production workflow requirements and their delivery expectations. In addition, production environments need to have the hardware and software installed to allow the media manager to perform file validation tests. Many file-based items need to be validated using the same NLE platform type that the post production team will use. These items include file integrity, audio and video track quality, metadata fields, timecode and others. This step of file-based validation is invaluable and absolutely necessary to validate media before it leaves the production site for post production. On the post production side, the skills of the edit assistant include the ability to work with different drive systems and understand the structure that the production side media manager has organized the media. In addition, the post production team will need the necessary skills and tools for any transcoding or file conversion steps, multicam grouping, timecode restriping or repair as well as the ability to modify or adjust any audio/video timecode sync issues prior to the editorial process. The post production team may also need to manage file-based media from various sources outside the production environment including ENG and social media. Lastly, the archive of media is another important element that needs to be accounted for early in the process. Whether cloud-based, tape-based or on spinning disk, an archive plan is a necessary requirement for this process. 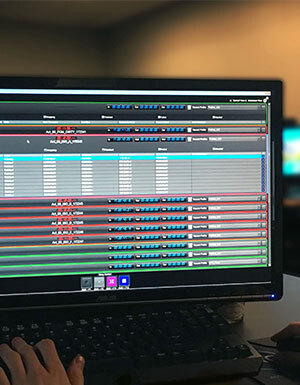 As productions continue to evolve, the various departments are required to keep up with the move towards an all file-based workflow. Following basic practices to address the concerns described above will lead to a successful file-based delivery and interchange between production and post production.